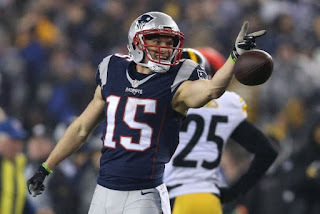 From college lacrosse player to NFL star wide receiver, Chris Hogan is proving himself to be a great pickup for the New England Patriots. Hogan turned in a very impressive performance in Sunday night’s AFC Championship win over the Pittsburgh Steelers to help send the Pats to the Super Bowl. He totaled nine catches for 180 yards and two touchdowns. His 180 receiving yards broke the franchise's postseason record for receiving yardage in a game. Hogan’s journey is surely one to remember. This is his first-ever appearance in the playoffs, and he’s off to an incredible start. But these accomplishments didn’t come overnight. Hogan’s story is outlined in this Instagram post that shows his development over the years. He played four years of lacrosse at Penn State and one year of football at Monmouth. Then he went undrafted in the NFL and was cut by four teams. Chris Hogan has played with a chip on his shoulder and like he’s got something to prove, all season long. That’s probably why he fits in so well with Tom Brady and the Patriots. Hogan is proud of his teammates and all of their accomplishments but still knows they’ve got one more thing to do. The New England Patriots will take on the Atlanta Falcons in Houston, Texas on Sunday, Feb. 5 for Super Bowl LI.